Lesson one, always close (suspend) your VM after use in case your laptop crashes. Guess what? My laptop crashed during wake up the next morning which required the holding of the power button with eyes closed and crossed fingers on the other hand. This ‘hard’ shut down also shut down my VM which crashed (blue screen of death) and freshly rebooted on next load. After the reboot any pages I published were constantly ‘Waiting for publish’. I opened ‘services’ to find the Tridion Transport and Publisher services were stopped… for what reason? My next move… check the Tridion Content Manager section in the windows event viewer. It was here that my suspicion was confirmed…. JAVA! Looking in my program files revealed two installations of the Java runtime library. 2 weeks ago!? I loaded the Oracle site and, boom, guess when the last release of Java was? 31st August 2012. I still don’t know why my Java updated. Perhaps I installed something that updated the files without realising. Anyway, I knew I was getting closer to my error. I checked my registry under HKEY_LOCAL_MACHINE/SOFTWARE/JAVASOFT/ and all the Java paths including JavaHome were pointing at my 32-bit version. So why had an update of the 64-bit version killed the publisher? I copied the files from a backed up installation into my 64 bit Java folder then rebooted, still no joy even though the configuration now mimicked my working backup VM. Concluding that Java had become miss configured somewhere I decided to fully reinstall Java from scratch. 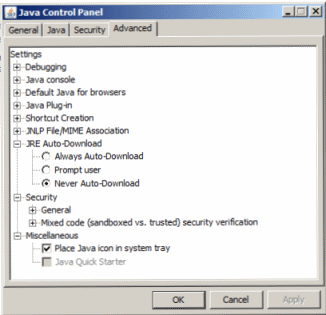 I went to Add/Remove Programs in Control Panel and uninstalled the Java SE. At this point it removed the 32-bit version because the JavaHome variable was pointing there. I headed over to my 64-bit program files folder and renamed the Java folder to ‘Java_bak’ (basically, the 64-bit installation had to go too). Running “Java -version” in a CMD complained it didn’t know ‘java’… it was gone, my life was slowly getting better. I downloaded the latest version of both the 64 and 32 bit installers from http://www.oracle.com/technetwork/java/javase/downloads/index.html. At this point I was still curious as to why I needed both a 32 and 64-bit Java versions if my registry JavaHome was only using the 32-bit version. Since the Tridion CM is installed in /Program Files (x86), it was logical that it uses the 32-bit version of Java so that’s the version I installed first. Joy! The Transport and Publisher services now started, I had my life back! Or did I…? I googled around a bit, twiddled my thumbs and then realized that the Deployer is on the Content Delivery side and must be using the 64-bit Java. So I installed the latest 64-bit version of Java. At this point I again had two Java folders, one under /Program Files/ and one under /Program Files (x86)/. Another shutdown/bootup and all my services started nice and dandy! I’ve been publishing my heart away ever since. The 64-bit is required for the Deployer and Content Delivery server roles, and the 32-bit for the Content Manager; On a VM you typically have both CM and CD installed on the same host, hence needing both Javas. We all know you should set Java to never auto update, but sometimes it can sneak in there without you realising. I just wanted to share my experience with anyone who may come across a similar situation in the future. At least now you may feel a little more confident on where to look when your Tridion suddenly stops publishing and hopefully have the confidence to remove Java and perform a new clean install. This entry was posted in Architecture, Helpful Tridion tips, Releases and tagged Broken Publisher, Java, JVM, Tridion 2011 by Jonathan Primmer. Bookmark the permalink. Great post. One thing to add: if your Java configuration is somehow broken and your running the web site on IIS (.NET), the problem sometimes shows up as a ‘windows process activation service has stopped’ error. This stops your entire app pool instantly. The only way out is to check the JavaSoft key in the registry and make sure all the paths are correct. Or – of course – uninstall and reinstall java like you did. Thanks for your addition Quirijn. Java configuration errors can be one of those fiddly issues that has you pulling your hair out all day. The more places we know to look, the better. I had the some problem, about a month ago, on one of the instances we are running. It had not been accessed for a while, logged in and saw the install screen to update Java. It failed to install for some unknown reason then Publisher and Transport services failed to start. The other Tridion services were fine. The CMS and CDA were on the same instance. Solution was the reinstall Java, first the 32 bit then the 64 bit versions. @Alastair: Thanks for your insight, it’s great to know that you came to the same conclusion as I with successful results. Great post! It definitely save me a few hours or figuring out the reason. I had the same problem and reinstalling Java (both 32/64 bits) fixed the problem. Thank you for the post! A client had same issue with Tranport Service. They had Java update set to automatic on servers. The solution was to uninstall and reinstall specific version of Java (1.6.0_26). Just adding on to my last comment. The latest Java version probably would have worked as well. (I will give it a shot on local VM). Client just wanted to keep same Java version on all servers.